Help VIDES Philippines build a livelihood and development center for underprivileged women in Cavite, Philippines. The two-storey facility seeks to provide an avenue for women empowerment, especially in the field of economic independence and sustainability. 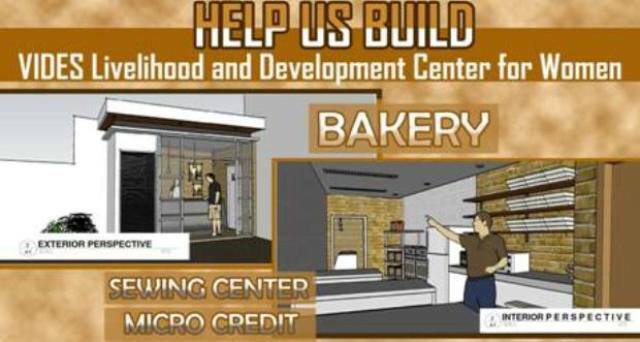 The center, which will be built on a 107 square meter lot area, will house a bakery, a sewing room, and a small office which will cater to microcredit and other livelihood projects. The target beneficiaries of this livelihood and development center are the relocated informal settlers from Barangay 143 in Pasay City to Trece Martires in Cavite. The more than 1,500 households are bereft with viable sources of income due to the remoteness of the relocation site and the unavailability of job opportunities in the community. 1. Buy a raffle ticket for only P200.00 each! Each ticket entitles you to join the raffle where you can win any one of the following: 1st Prize - 4 days & 3 nights trip for 2 to Bangkok, Thailand (hotel and roundtrip flights via PAL); 2nd Prize - 3 days & 2 nights trip for 2 to Coron, Palawan; 3rd Prize- 3 days & 2 nights trip for 2 to Boracay. All donations will go to the construction of the proposed two-storey VIDES Philippines Livelihood and Development Center for Women in Bella Vista, Trece Martires, Cavite. Your contributions will enable us to help underprivileged women help themselves and their families by providing a venue where they can receive training on sewing, baking, marketing, and entrepreneurship. Help comes in many forms. If you are unable to make a financial contribution but still want to help us, please help us spread the word and share this campaign with your family and friends. Make the VIDES Livelihood and Development Center become a reality! Help build the facility. Help empower women. Help change lives.